LinkAssistant 6.23.16 For Mac is your secret weapon in the popularity skirmish. Use it to outrank the competitors in 562 search engines. Get your hands on its killer combination of user-friendly interface and the incredible number of features and funcs for every link-building job you will ever have to carry out: from finding the most relevant linking partners and organizing e-mail communication with them, to monitoring and reporting on your progress. 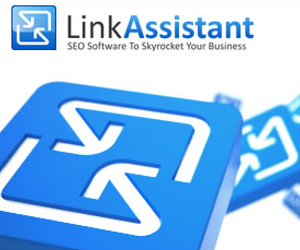 LinkAssistant 6.23.16 is a powerful link building software for Windows PC that helps you quickly propel your website in Google by getting thousands of quality backlinks pointing to your site. LinkAssistant considers only reputable sites to exchange links with. It will look for link partners according to niche-specific keywords you type in. It will also display partner’s Google PR, Alexa Rank, IP address, domain age, and other info, for you to hand-pick only relevant sites for link exchange. Need tons and tons of links to overtake competitors? Not a problem – LinkAssistant for PC uses 6 highly efficient methods of link partner search and will get you as many links as you need. LinkAssistant will also create a link directory that fits your site’s design like a glove. And you can easily upload it to your site without switching to another FTP program. LinkAssistant 6.23.16 offers ready-made email templates and allows you to send out 100s of personalized link exchange requests in just a click. Besides, it will extract link partner’s information and auto-fill out all the necessary forms. Once other websites put links to your site, LinkAssistanthelps you easily manage your backlinks, too. You can blacklist partners, assign them different statuses, carry out 3- or 4-way link schemes, and more. Besides, you can make sure all your backlinks are in place and nobody is cheating you by using nofollow, robot txt, redirects, etc. at any time. LinkAssistant for Desktop is cross-platform and is available in 7 languages. Choose your research technique from 10 most effective prospecting mechanisms (guest posting, directories, reviews – you name it), or create your own research method with any search operators of your choice. In seconds, LinkAssistant will find hundreds of most relevant prospects for you. This is a huge time-saver for any SEO. Gather all kinds of stats and insights with one click to check the value of potential links. You’ll see the value of the prospect by looking at its quality factors, such as Page/Domain Authority, Domain age, Alexa, social media metrics, etc. LinkAssistant makes sure you avoid all potentially harmful links! Gather all contact emails automatically and contact link prospects straight away, right from the app. Use handy email templates for every type of outreach to make your emails feel personal, or create your own templates. Easily track sents and replies, flag important emails so you don’t forget to reply or follow up. Stay in touch without any effort and get the links you are after or delete the links you don’t approve of. Run regular link checks to make sure your acquired links don’t get taken down, switched to no-follow, or have the wrong anchors. Contact partners right away if a link fails verification! LinkAssistant’s reports are customizable, white-label, and designed for all devices. You can easily share them with clients by uploading your report to the cloud and receiving a shareable link. Looking for a way to automate reporting completely? Set up a scheduled task, and LinkAssistant will build reports on autopilot and deliver them to clients on your schedule, as a direct link or attachment, in a plain text or custom HTML email. How To Install LinkAssistant 6.23.16? Download LinkAssistant 6.23.16 from below. LinkAssistant 6.23.16 For Mac Free Download Link is Given Below!